Deputy Prime Minister and Foreign Minister Pham Gia Khiem conveyed a message of loyalty to African “comrades-in-arms” at a ceremony to mark the 45th African Day in Ha Noi on May 26. “Viet Nam always treasures traditional friendship and solidarity with African people, comrades in arms during the struggle against colonialism,” Khiem told the African diplomatic corps at the event. Ambassador Naceur Boucherit on behalf of African ambassadors said he strongly believed in the further development of friendship between Vietnam and African countries. He said the relationship would bring in great and practical results in the interest of African nations and Vietnam as well as for peace, stability and development in their regions and the world as a whole. The event to mark the foundation of the United Africa Organisation (OAU), now the African Union (AU), on May 25, 1963, was co-sponsored by the Viet Nam Union of Friendship Organisations (VUFO) and the Viet Nam-Africa Friendship and Cooperation Association. 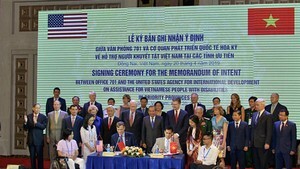 Ties between Viet Nam and Africa have stood the test of time as thousands of experts and workers from the Asian nation have assisted African bloc members in education, healthcare, agriculture and construction. In agriculture, Vietnamese experts have transferred wet rice farming and animal husbandry techniques to farmers in some of the African countries.